I love Blog Back Time Thursday's over at Lola's Diner. The stories that she and other blogger's post are really funny and entertaining, and if you'd like to participate, head over there, grab the picture, put your blog address on McLinky, and you're good to go!! None of you will believe this, but I have never gone on a "real date" before; seriously, because of the church I belong to, once you become a member, you do not date. So, I don't really have any really good stories to tell, but I do have one memorable moment that kinda, sorta, maybe counts as a "date:"
It was back in the early 80's, and I was living in Big Town. There was a guy who was totally interested in me, and I kept trying to explain to him how I did not date, etc. Anyway, he was very insistent, so I finally agreed to go out for ice cream with him. SO, we go to this place not far from my apt. complex. We are sitting there, just kind of looking at each other, and he doesn't say much of anything. There was this older couple at the next table over, and they are looking at us like, "Ooooohhhh CUTE! A young couple in love....," and I'm looking at them and thinking, "WRONG-O!" SO, the waitress comes and wants to know what we would like. I wanted to just get the heck out of there, but for politeness sake, I order a small sundae. The boyfriend wanna-be ordered not one, but three ice cream treats...you heard me right, THREE!! And not just three little treats, like small dishes of ice cream; he orders the biggest ones that they offer!! I just about died!! I looked at him like he was crazy, and in my head I'm thinking, "I wonder how big the bathroom window is...will I fit?...." SOOOOO, the ice cream finally arrives, and it was so embarrassing to sit there with BFFWV (Boyfriend-From-Weirds-Ville) who was eating like he'd never seen ice cream before. Needless to say, I was relieved when he took me back home. Then, to top it off, he wanted to know when we could go out again!! I just looked at him wordlessly, and went inside my apt. This will take you to a customer representative. 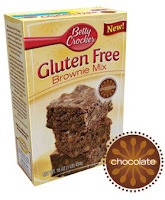 Tell the representative that you are interested in the free gluten-free baking coupons. He/she will ask a few questions: Zip code, whether your household did not limit gluten ingestion, limited gluten or was gluten-free, how many people live in the house and where you normally shop for gluten-free food (the name and street address of the store) and your address. **Please keep in mind that the customer service Representatives are only available from 7:30 am-5:30 pm Central time. I'm wondering if he finished all three dishes! How funny, Was he a big man? and I guess he ate it all. any way I love the BFFWV, I think I'll try that out on my teen,lol. she has had one of those! Great post. So maybe he was a growing boy! My son can polish off a whole 1/2 gallon of ice cream and I'm sure he could definitely polish off 3 ice cream desserts. Lol! I thought the guy was a genius for ordering 3 sundaes. Maybe its just me? 7 years ago when I started working here this young guy who worked on stuff with my boss started talking to me. He eventually convinced me to go out with him. I figured he was about 30 so it wasn't too bad and if Demi could do it then I could. Well later in the evening I finally asked how old he was and kept going backward from 30 until I hit 24 which was my son's age. That freaked me out-I honestly don't know how men do it with teenagers-ugh. Then he called me frigid cos I wouldn't sleep with him. There was the wealthy guy whose mama paid him to be available and never work. There was the guy I met on the internet in those early days who turned out to be married (long distance). A couple alcoholics. I think I need to go to your church. And with all that the young guy was probably the only "real" date I ever had.